We’ve been putting the final touches on the HIFF 2018 lineup, and we are thrilled to announce it’s now ready for its closeup, Mr. DeMille! 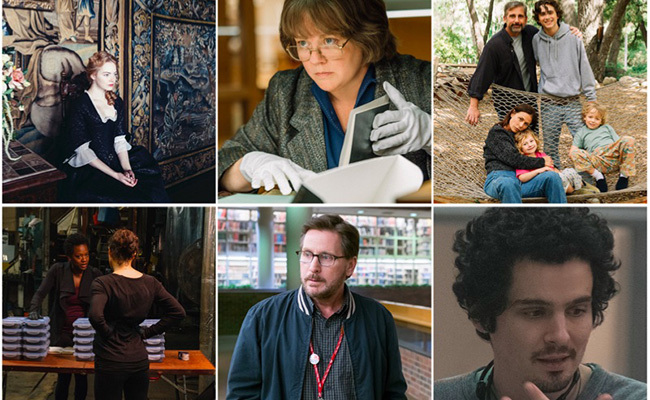 The latest announcement includes several high-profile additions in our Centerpiece slots: the Friday Centerpiece film is Yorgos Lanthimos’ THE FAVOURITE, starring Academy Award®-winning actresses Emma Stone and Rachel Weisz and Golden Globe®-winning actress Olivia Colman, about two cousins fighting to be the court favorite of Queen Anne; and Marielle Heller’s CAN YOU EVER FORGIVE ME? will screen as the Sunday Centerpiece, a biopic based on the life of writer Lee Israel and starring Academy Award®-nominated actress Melissa McCarthy. The festival also added two films to the Spotlight section: Academy Award®-nominated director Steve McQueen’s WIDOWS, starring Academy Award®-winning actress Viola Davis and Michelle Rodriguez, the story of four women with nothing in common except a debt left behind by their dead husbands’ criminal activities; and the East Coast Premiere of Felix Van Groeningen’s (HIFF 2009 & 2013 alum) BEAUTIFUL BOY, starring Academy Award®-nominated actor Timothée Chalamet and Golden Globe®-nominated actor Steve Carell, adapted from father and son David and Nic Sheff’s best-selling memoirs about a son’s struggle with drug addiction that threatens to tear a family apart. HIFF 2018 will offer three conversations with leading filmmakers: Maggie Gyllenhaal, star of Opening Night film THE KINDERGARTEN TEACHER; Emilio Estevez, director of Spotlight film THE PUBLIC; and Damien Chazelle, director of the Saturday Centerpiece film FIRST MAN. All film sections have now been announced, including Air Land & Sea, Compassion, Justice & Animal Rights, Conflict & Resolution, Documentary and Narrative Competition, Opening, Closing & Centerpieces, Short Films, Spotlight, Views From Long Island, Winick Talks, World Cinema Documentary and World Cinema Narrative. Ticket package selections begin on Thursday (for First Dibs Companion packages) and Saturday (for all other ticket packages). Individual tickets go on sale on Monday, September 24, at 12:00pm noon.